Methyl CpG binding protein 2 (MeCP2) is a multifunctional protein which binds to methylated CpG, mutation of which cause a neurodevelopmental disorder, Rett syndrome. MeCP2 can function as both transcriptional activator and repressor of target gene. MeCP2 regulate gene expression in both neuron and glial cells in central nervous system (CNS). Oligodendrocytes, the myelinating cells of CNS, are required for normal functioning of neurons and are regulated by several transcription factors during their differentiation. In current study, we focused on the role of MeCP2 as transcription regulator of myelin genes in cultured rat oligodendrocytes. We have observed expression of MeCP2 at all stages of oligodendrocyte development. 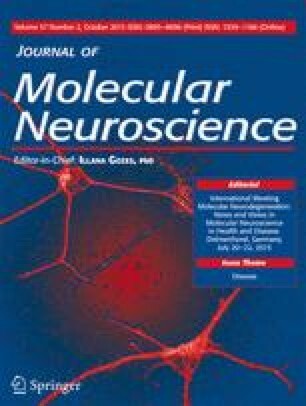 MeCP2 knockdown in cultured oligodendrocytes by small interference RNA (siRNA) has shown increase in myelin genes (myelin basic protein (MBP), proteolipid protein (PLP), myelin oligodendrocyte glycoprotein (MOG), and myelin-associated oligodendrocyte basic protein (MOBP)), neurotrophin (brain-derived neurotrophic factor (BDNF)), and transcriptional regulator (YY1) transcripts level, which are involved in regulation of oligodendrocyte differentiation and myelination. Further, we also found that protein levels of MBP, PLP, DM-20, and BDNF also significantly upregulated in MeCP2 knockdown oligodendrocytes. Our study suggests that the MeCP2 acts as a negative regulator of myelin protein expression. This work was supported by grants from the Department of Biotechnology (DBT), New Delhi, India, (sanction order no. BT/PR4974/MED/30/773/2012 dated 10/09/2013). We thank the Department of Biotechnology (DBT), New Delhi, India, and University Grants Commission (UGC), New Delhi, India (UGC reference no. and date- F. no. 41-148/2012 (SR) dated 13/07/2012) for awarding Junior Research Fellows (JRFs) to Kedarlal Sharma and Juhi Singh, respectively. We are also very much thankful to DBT-ILSPARE Programme, for providing us the Confocal microscopy and Real-Time PCR facility in Dr. Vikram Sarabhai Science Block, Faculty of Science, MSU, Baroda.